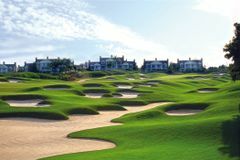 Orlando is the ultimate Florida holiday destination, with endless attractions, the world famous theme parks, an array of fine hotels and resorts, as well as some terrific championship golf. At the heart of any trip to Orlando, particularly for families, is the Walt Disney World Resort, which features 4 theme parks, 2 water parks and a multitude of shopping and dining areas. Base your stay in one of our specially selected accommodations, many located around International Drive, and enjoy immediate access to the most popular Orlando attractions, as well as the perfect starting point to experience Orlando's wealth of fantastic courses. To plan your perfect tour speak to our dedicated Orlando specialists. We found 12 offers matching your search.